Entertainment is a part of our everyday life. We relax at home after a hectic day watching our favorite TV shows or playing games on our big TV screens. However, we need our TV screens and other tech accessories such as DVD players and consoles to be in a perfect position and occupy just the right amount of space. A well-designed corner TV stand should accommodate your TV screen and all the tech accessories. A built-in cable management system and proper ventilation are some of the basic features a good TV stand should have. Because the market is currently overflowing with corner TV stands, we decided to look for some excellent ones with unique features for you. The table has a unique corner design which fits nicely into your corner space. 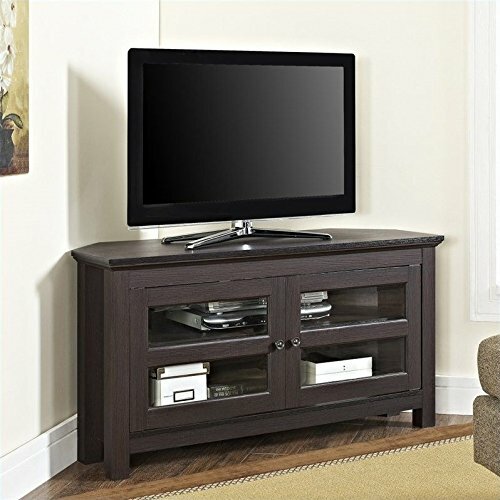 This corner TV stand is made of high-grade MDF which makes it sturdy to support up to 250lbs. Its espresso finish blends attractively into your home. The stand has a width of 44” which means it can accommodate TV’s up to 44” wide. It has enough space on top for you to place extra decorations such as picture frames or ornaments. This unit has adjustable shelves which accommodate all your other TV accessories. The shelves have two tempered glass doors which keep your accessories locked in for safety. The doors allow infrared rays to pass through; consequently, you can use your remote with the doors locked. A corner design TV stand with a removable mount makes a whole difference not only to your entertainment but also to space saved. The removable TV mount provides you with extra space to place ornaments or other media accessories. This unit is composed of high-grade MDF and laminate, which makes it robust to accommodate all your entertainment devices. Its 58″ wide and can accommodate up to 60″ wide TV screen. It has open adjustable shelves that can fit all your media accessories. Each of the shelves has an inbuilt cable management system which prevents any cable entanglement. Since the shelves are open, there is enough ventilation to keep your tech cool when running. It’s available in a wide range of color giving you the freedom to pick the one that blends well with your current home design. The Sauder 410627 has an oiled oak finish which blends well with any interior design as it gives your home an extra touch of elegant furniture without being too imposing. As per the stands general size, it’s suitable for apartments or offices with small space left as it will fit comfortably. The stand holds up to 40” TV with a maximum base of 39.25”. This unit has compartments for your media equipment and extra closed space to provide additional storage space. It’s good to note that this stand only holds up to 95 pounds so do not place too much equipment on the stand. 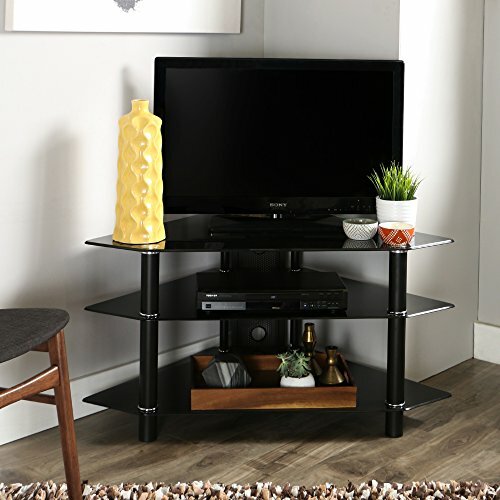 The Furinno Turn-N-Tube TV corner stand is composed of engineered particleboard and PVC tubes. It comes in a wide range of colors that easily blend with your current furniture. The stand has an open display rack design which provides enough space for your TV, media accessories and even decorations. The design also fits well into corners which makes it perfect for utilizing that space. The top holds up to 37” TV screen and a weight of up to 50lbs which makes it perfect for holding medium size TV screens. 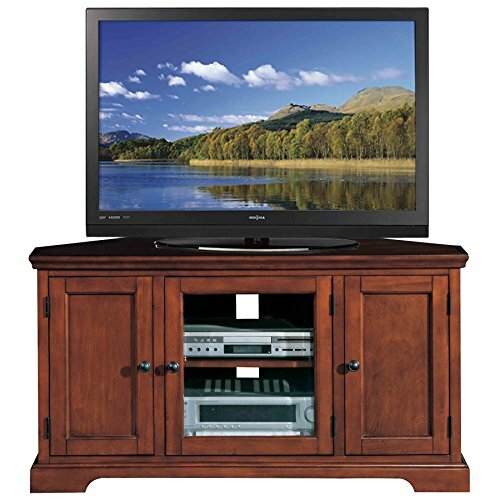 This Leick corner TV stand is composed of hardwood making it strong and durable. Its brown cherry finish blends well with most interior designs because it’s neutral and yet welcoming. The design is also small enough to fit into small corners in your apartment or office. This stand has a 46” top and can hold up to 50” TV. It has a weight capacity of up to 240lbs making it suited to hold lots of equipment including TV, media accessories and ornaments. The TV screen capacity and weight capacity makes it an essential part of your furniture as it occupies little space and yet can hold a lot of equipment apart from your TV. It has three compartments, i.e., a beveled bronze tinted glass door compartment which is at the center and two side compartments with wooden doors. The glass door compartment allows easy use of remote controls so you can place your remote controlled accessories in that compartment and the side compartments are extra storage spaces. Its back panel is perforated for cable management and also to act as ventilation to keep all your tech accessories cool. This Sauder 420471 combines luxury and intricacy to bring you a cool harbor view stand. Sauder products are composed of engineered wood, and this is no different. It has a Curado Cherry finish that stands out and blends right into your interior design. Its corner design fits nicely utilizing your corner space. The top is wide enough to accommodate up to 60” TV and leave extra space for place decorations. The design has a weight capacity of up to 95lbs. It features two adjacent shelves at the center and two adjacent shelves at the corners to accommodate your media devices. Two drawers with metal runners and safety stops are available at the center to provide extra storage space. For an easy code management system and proper ventilation to your devices, it has grommet holes in the back panel for each compartment. 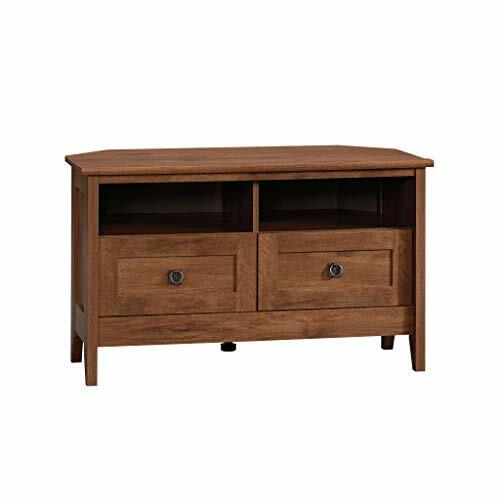 Sauder 403818 is an engineered wood TV stand featuring a combination of Carolina oak finish that blends perfectly with most interior design and a corner design that fits well to utilize all space. The top can comfortably hold up to a 50″ TV screen and has an overall weight capacity of up to 135lbs. The two adjustable shelves at the center and two at the edges create additional space to accommodate your media devices and other items that can fit such as ornaments and books. There are two drawers with metal runners and safety stops which provide a safe storage place for your accessories. The back panel has perforations which help in cable management to make sure your entertainment space is well organized. The Walker Edison is designed to fit perfectly into the corner space and provide ample space for your entertainment equipment. The stand of composed of three tempered glass shelves and powder coated metal tubes for support. The powder coating prevents damage from scratches increasing its durability. It supports up to 48″ TV panels and has a weight capacity of up to 250lbs. This is made possible by the reinforced tempered glass and metal tubing structure. The three glass shelves provide a lot of space to fit your gaming and other media devices effortlessly. The integrated cable management system makes sure the stand is neat by helping you organize your cables. Challenging to put cables through the cable management system. 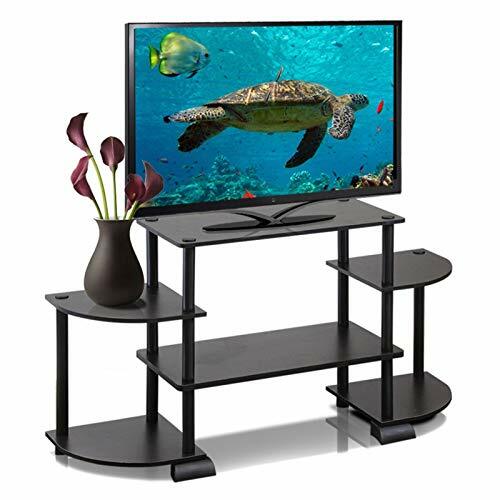 The Avista Sovereign TV stand is made of tempered glass and black powder coated metal. Its Avista Foldtech system design that requires no tools makes it easy to assemble saving you lots of time. This stand has a unique dark espresso finish that blends well with most interior decors. The glass shelves have a corner design ergonomic shape that utilizes the corner space well making it suitable for small areas. Its metallic support system is powder coated making it scratch resistant and sturdy to keep your equipment safe. It has three tempered glass shelves which provide sufficient space for your video and audio components. It can hold up to 55″ flat TV panel and has a maximum weight capacity of 130lbs. To enable cable management, it has a meshed back panel which keeps your cables out of sight and well organized. This keeps your TV stand neat and tangle free. 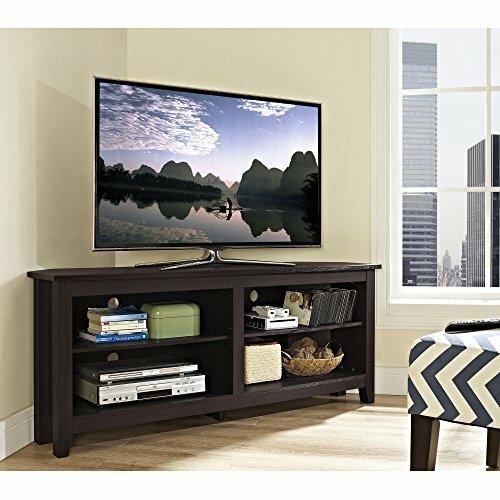 The Home Styles 5543-07 Bermuda Corner TV Stand is impeccably constructed to fit into small spaces while providing abundant space for your media devices and extra storage space. 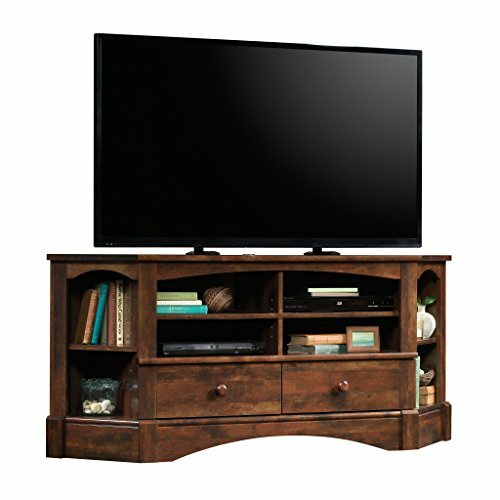 Built with poplar wood, Home Styles stand is sturdy to hold up to 52″ TV panel and put up with almost 150lbs. It has a hand polished white finish which blends well with most designs. Apart from its beautiful finish, it has ample of storage space as the center partition has three adjustable shelves and two adjacent storage cabinets each with adjustable shelves. This offers enough space for all your media devices, books, and ornaments. All the shelves have cable access points for neat wire management which keeps your stand organized. The cable management perforations also act as ventilation systems to keep your devices cool when in use. A) Size: The actual size of your TV determines the size of the corner TV stand you should buy. The size given by the manufacturers is only for the diagonal size of your screen which leaves out the bezel. To know the actual size of your TV, you have to measure it from the frame diagonally. This ensures that you don’t end up acquiring a smaller corner stand that does not accommodate your TV. The size of the TV stand also counts as it should measure up with the corner space you’re willing to spare. Buy something that fits well and can accommodate your TV perfectly with some edges to spare. 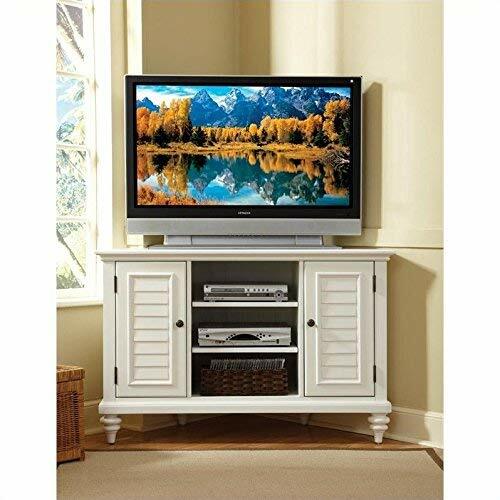 B) Material: Most corner TV stands are constructed using solid wood, engineered wood, metal or glass. Each material has its strengths and weaknesses; for example, solid wood is sturdy but can break if put under wrong humidity. Choose a material that is strong enough to hold your TV and other media accessories comfortably. C) Height: The midpoint of your TV should be in line with your line of sight. Use your usual seating position to measure this to get a stand with a height that will place the TV at that approximate line of sight. How much wider should the TV stand be than your TV? Your TV should not feel up all your corner stand space. It should leave at least two to three inches on the stand for safety reasons. If my TV stand has glass doors, will my remotes work well for the electronics behind the glass doors? Most electronic devices such as cable boxes and DVD players use IR remotes which require a line of sight to work. Glass doors are IR friendly as they do not block the line of sight meaning the remotes will work well. Other solid materials such as wood or metal will obstruct the IR signal if they are used to make your stand doors. Do corner TV stands have weight limits? Yes. Most modern TV’s and electronics are relatively light, and the weight limit should not worry you much. Nevertheless, always check the weight limit of the stand to that of your electronics to make sure your electronics are well supported without causing the stand to break or collapse. How hard is it to assemble a corner TV stand? Most TV stands come ready to assemble, and it usually takes you about 1hr or less to complete the assembly. If you’ve ever worked on DIY or put together furniture projects, it should be quite easy for you. A corner TV stand is a perfect way to enhance your viewing or gaming experience while using minimum space possible. A good corner TV stand should have features that match well with your requirements, and you should, therefore, choose carefully to avoid any disappointments. This review should help you narrow down and navigate the extensive corner TV stand market to make a wise decision on your purchase. Always buy something that blends well, maximizes space, and adds elegance to your current design and it will serve you right.